C2_01907_R2 (l-r.) Jacob ‘Stitch’ Duran as Stitch-Cutman, Sylvester Stallone as Rocky Balboa, Michael B. Jordan as Adonis Creed and Wood Harris as Tony ‘Little Duke’ Burton in CREED II, a Metro Goldwyn Mayer Pictures and Warner Bros. Pictures film. Credit: Barry Wetcher / Metro Goldwyn Mayer Pictures / Warner Bros. Pictures © 2018 Metro-Goldwyn-Mayer Pictures Inc. and Warner Bros. Entertainment Inc. All Rights Reserved. After Creed stunned the world by becoming a box office success and a critical darling, it was a no brainer to reunite the gang for a second installment. Ryan Coogler is not on board to direct this time around but remains on board as an executive producer. The Rocky series has had its highs and lows over the years and Creed II fits somewhere in between. It is certainly not the worst film in the franchise but it is far from the best. The filmmakers’ need to live up to audience expectations can bog the film down at times. The main problem stems from the fact that Creed II is clearly attempting to wring a plot of thin air. Much like the first installment, this film is being made after the main story line of the franchise had appeared to resolve itself. The first installment benefited immensely from being able to use its plot as a device to speak about the deeper truths of the human condition. Meanwhile, Creed II traffics in the cliche far too often for our liking. It is the type of movie that you watch because you already know what is going to happen and you are fine with the formula. In other words, there are no real surprises to be had here. The spontaneous nature of Creed has given way to a paint by numbers sports flick. Seasoned Rocky viewers will notice that Stallone’s script seems to suffer from many of the same issues that plagued the sequel to the original Rocky film. 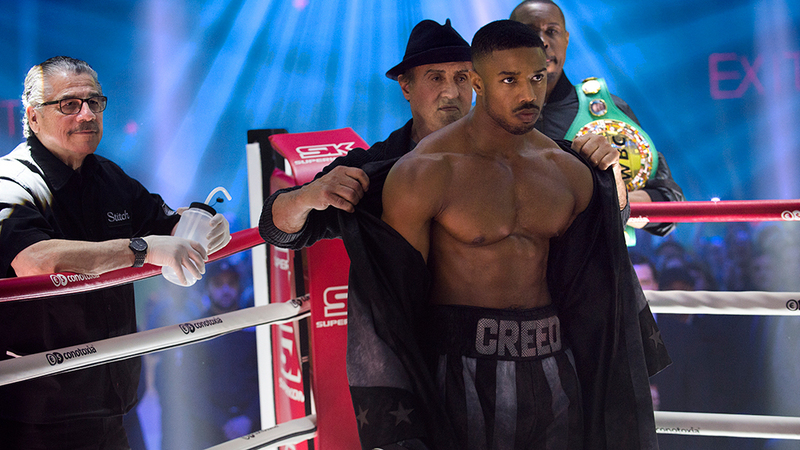 Since you already know that Adonis (Michael B. Jordan) will recover from his earlier defeat and win the title. Obviously, he is going to lose focus once the belt is in hand and he is goaded into a losing battle with the son of Ivan Drago. To make matters more stressful, Rocky is no longer on his side when it comes to fighting and his girlfriend Bianca (Tessa Thompson) is with child. The pace is choppy, due to the need to cover such a wide scope. There is also the matter of shoehorning Stallone into as many scenes as possible. He does not have much to do but the filmmakers seem to understand that the die hard Rocky fans will need to see as much of you as possible. Since he is not the star of the film, this creates a very strange dynamic that is never quite resolved. The most pleasant surprise that the film has to offer is Ivan Drago’s performance. Dolph Lundgren gives the character a richer backstory, explaining the aftermath of the infamous fight from the original films. He was abandoned by his wife after losing the fight and even his own countrymen turned on him. The younger Drago is trained in an atmosphere of anger and resentment as a result. Those in search of the same poignancy that buoyed Creed are going to be out of luck. This is your normal, everyday cash in sequel. This is a film that checks all of the boxes you would expect and sticks to the formula every single step of the way. impressively, the movie compensates with some fascinating father-son Drago tensions, the Russian oligarchs swarming, redemption at hand. Creed II is a terrific movie, a boxing picture full of inspired sweetness and shrewd science that honors the cherished traditions of the genre while feeling like something new and exciting in the world. Powered by soulful performances by Sylvester Stallone and Michael B Jordan, the Rocky franchise has produced one of the best films of the year. © 2019 Blu-ray Filmer. All Rights Reserved.